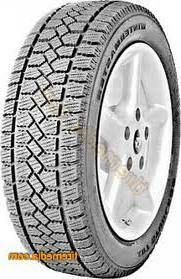 Non-directional tread pattern allows for cross tire rotation during service life of the tire. Tire mileage is extended by helping to even out treadwear variations. Specially formulated for cold weather conditions, the compound remains pliable despite freezing highway surfaces. Ice and snow traction remain very good. The compound contains a special particle additive which helps to increase traction by forming additional gripping edges. This is especially beneficial for ice traction. This new studless snow radial meets Q rated speed criteria of 99 mph or 160 km/h on indoor wheel tests. Meets RMA severe snow definition.